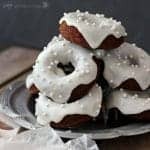 Tender baked apple cider donuts, infused with warm spice and lots of apple flavor, with a crunchy cinnamon sugar coating that’s like a bite of pure fall! Is it starting to feel like fall yet for you? Here in the northeast, the temps have been quite brisk in the mornings and evenings. You can smell that hint of wood smoke in the air, and the leaves are just beginning to turn. All this can only mean one thing: cider donuts! It’s so much fun to take a trip to a local farm, go on a hayride, pick out pumpkins, and eat cider donuts. It’s become a fall tradition for my family and so many others. Donuts are notorious for being a pain to make. Most of us don’t want to have to fuss around with a big heavy pot of boiling hot oil. That’s why I love my donut pan. It makes homemade donuts so quick and painless. The only down side is, sometimes you don’t get that crispy exterior. 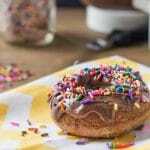 I just love when a crispy exterior gives way to a soft, tender cake donut. If I can’t have that, then I don’t really want baked apple cider donuts, to be honest. So here we have a way around it. After the baked apple cider donuts have cooled a bit, give them a dunk in a thin cinnamon cider glaze. It reinforces all the flavors, as well as forms a little bit of a hard shell/crust on the outside of the donut. Then, while the glaze is still sticky, coat them generously in cinnamon sugar. I like to use sparkling sugar for this- the crystals are larger and crunchier and less likely to dissolve when they hit the wet glaze. I can find it easily in my supermarket or craft store, and I try to keep it on hand at all times because it’s such a versatile ingredient. If you have any trouble locating it, here’s a link to buy some online. 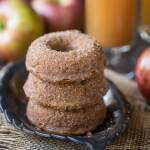 Another ingredient I really love for these baked apple cider donuts is boiled cider! Have you seen it around? I notice it every fall, in all the kitchen stores. It looks like a thick, dark brown syrup. Last year, King Arthur Flour was kind enough to send me a bottle and I just love it. It imparts SO much apple flavor. You can buy it here, or make your own by following this easy recipe. 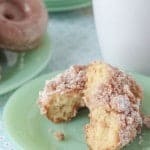 I hope you’ll make it a tradition to mix up a batch of these baked apple cider donuts every year! They’re quick and simple, so delicious, and perfect for fall! 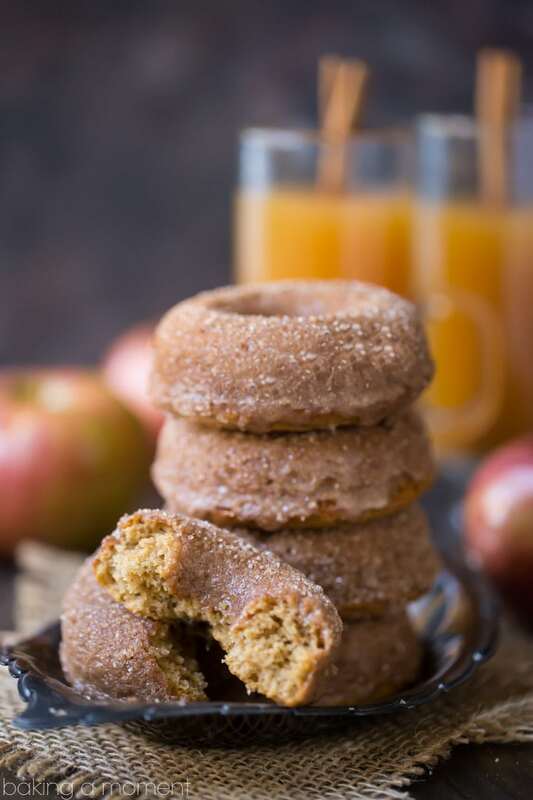 Tender baked apple cider donuts, infused with warm spice and lots of apple flavor, with a crunchy cinnamon sugar coating that's like a bite of pure fall! 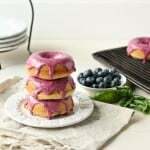 Preheat the oven to 350 degrees F and mist a donut pan with non-stick spray. Place the flour, sugar, baking soda, cinnamon, salt, and nutmeg in a medium bowl and whisk to combine. Place the boiled cider, oil, Greek yogurt, and egg in a large liquid measuring cup and whisk to combine. Pour the liquid ingredients into the dry, and fold together until just barely combined. 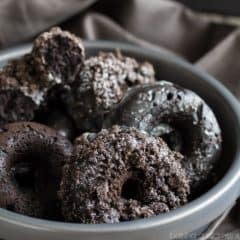 Transfer the batter to the prepared pan and bake for 12 to 15 minutes, or until a toothpick inserted in the thickest part of a donut comes out clean or with a few moist crumbs. Stir the powdered sugar, cinnamon, milk, and boiled cider together in a small bowl. Dip the donuts in the glaze, then top with cinnamon sugar. I have not seen boiled cider, but I have made an apple cider syrup by reducing it, and it’s probably very similar. I LOVE it. You’re right, perfect for these donuts. Every year, I intend to make apple cider donuts and haven’t yet, but I will start with these. You sold me on the crunchy cinnamon-sugar coating and the glaze! We *finally* got a cool snap here in FL, and it’s so nice to actually feel fall-like weather!! It was my favorite season when I lived in PA! Ooh, I didn’t realize you were in Florida Sarah! I hope you’re ok after that hurricane. And from PA- my home state! I knew I liked you 😉 Hope you get a chance to try this recipe soon. Thanks for the sweet comment! It makes exactly 6 Lee! Thanks for reading and for the great question. We need some fall weather here, or maybe I should just say I want the fall weather!! We are still pretty warm during the day. I haven’t seen boiled cider but it sounds so interesting. 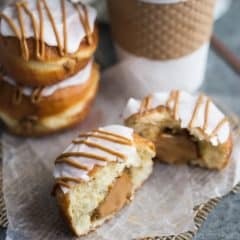 And these donuts, YUM!!!!! The boiled cider gave such an intense apple flavor! Definitely worth picking up a bottle, Malinda. I hope the cooler temps make their way to you soon! hey allie…I can’t get boiled cider here, and don’t think I can really find apple cider here. But just a question as I consider making it myself…how pure does the apple juice have to be? Will it work with any old apple juice as I think most of the juices here are mostly sugar and water and perhaps a bit of real fruit? The main difference between apple cider and apple juice is just juice is filtered and pasteurized, and cider is usually unfiltered. They just crush the fruit and bottle the liquid. It’s got a more intense apple flavor. You could try reducing apple juice to a thick, dark syrup and probably get a similar result. I hope that helps Julie! Made these yesterday and was told they were alittle fry…. A little dry you mean? I’m sorry to hear that- maybe next time decrease the bake time by a minute or two. You could also try upping the oil just a bit. Thanks for the feedback and I hope you have better luck next time! I made them today and they were delicious…very moist. They worked well for our family’s Halloween celebration. I want to make these! Can I use regular apple cider from the farm? You can if you boil it down as per the linked recipe! Good luck! One of my very favorite things in the fall are apple cider donuts! I can’t wait to make these! 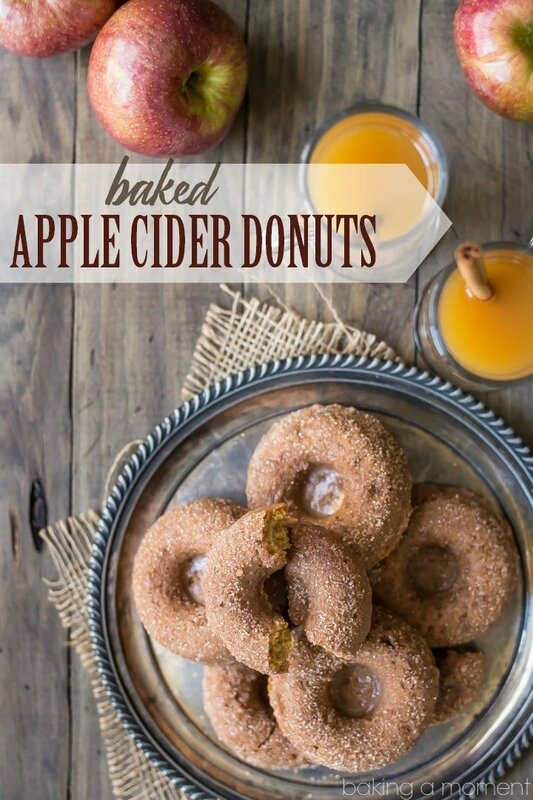 These baked apple cider donuts scream fall in such a wonderful way! I bet the kitchen smells amazing while these are baking! 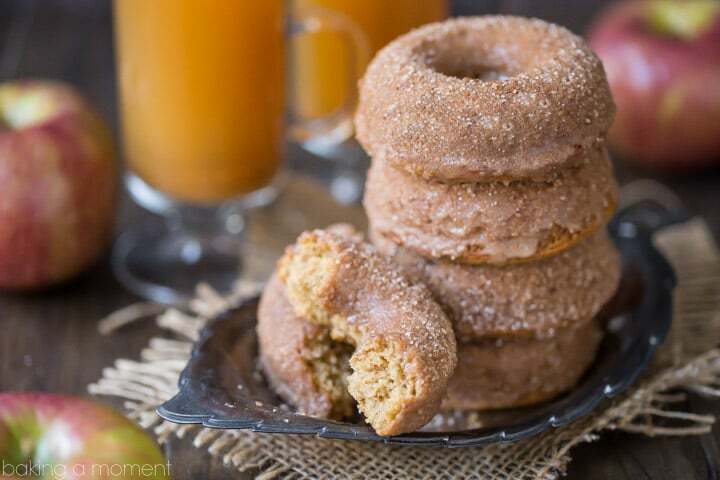 My favorite fall treat is cider donuts! I’ll have to try your baked version.